He is a man and that is no small thing… Jamie – My Outlander Blog! In one of the later books, Bree and her mother are discussing how people know what they are meant to be in life. During the discussion, Bree asks if her father knew what he was meant to be. Claire answers , ” …a man and that is no small thing.” Men. What makes a man a man? I believe that Diana Gabaldon has given us the portrait of what it means to be a man in the character of Jamie Fraser. If you asked readers of Outlander why they love Jamie, I’m sure you would get many different answers. Some might focus on his looks, virility or his heroism and these qualities are well worth the focus, but I believe there is so much more to love about Jamie Fraser. In this scene, we see Jamie’s willingness to stay in what was most certainly an emotionally awkward situation. He sees someone who is frightened and alone and doesn’t walk away. Instead, he comforts and reassures. He tells her she need not be afraid of him or anyone else because he will protect her. A man isn’t afraid to be present in the face of deep emotions. A man protects those who need protection. Even Claire is baffled by this one! What kind of guts does it take to take a beating in front of a crowd while still being injured for someone you hardly know? Jamie explains that some scars last longer than others and he is willing to feel pain for a short while to save another from being shamed. This won’t be the last time we see Jamie make a self-sacrificing decision. I think this is the scene that made me sit up and notice that this man was special. A man is gallant and brave. Even though he knows Claire really doesn’t want to marry him, Jamie negotiates for a real wedding. Or, at least as real as you’re going to get in their situation. He wants Claire to have a dress, flowers and groom she can be proud of marrying. He thought about the ceremony and did his best to give her all he could, including his mother’s pearls. His efforts set the tone for their marriage and do not go unnoticed by Claire or the reader. We see his romantic side and it is charming. Men hold their spouses in high esteem and treat them as cherished life partners. Despite believing his wife may have run away on purpose or that she may be an English spy and the very real danger he may be killed for the effort, Jamie comes to Claire’s rescue. This place is full of emotional significance for Jamie. It is where he was beaten within an inch of his life and he has avoided it in order not to be recaptured and most certainly put to death. For her sake, he charges ahead with nothing but an empty gun. His actions are very brave and his efforts are heroic. However, what strikes me as significant is the reason for his heroism; he promised to protect her. Men are loyal and trustworthy. There’s no doubt that he is angry when they are on the road after the rescue. Emotions are running on high for both Claire and Jamie. Claire went off on her own after he told her to stay put and she got herself captured by the redcoats. He is especially upset because she disobeyed him and and as a result put herself and others in a life-threatening situation . Now, I’m sure that there are plenty of readers out there that have an issue with this obedience thing not to mention the actual spanking, but Jamie is worried for Claire’s safety when he asks her to obey. He isn’t pulling a power play and he isn’t angry when he takes off his belt. He just knows Claire and her propensity for trouble. The whole spanking scene is about his commitment to Claire not his need to punish her. He is thinking about their future. Men aren’t afraid to do the hard things to keep their relationship and love ones safe. I loved these scenes! We see Jamie at his self-deprecating finest. He knows Claire’s pride is suffering so, he tells her some pretty embarrassing stories about himself. It is obvious that he knows he doesn’t always do or say the right thing, but he isn’t afraid to let Claire see his less flattering side because his self-image is secure. The reader also gets the sense that Jamie learns from his mistakes. His willingness to share his foibles is touching and makes him likable. Now it’s Jamie’s turn to be baffled by Claire’s response. He saves her life and she is angry, but when he shares his most embarrassing moments she tells him she loves him and so do we. Men aren’t afraid to reveal who they truly are foibles and all. How do you even begin to appreciate what this man went through; rescuing her from a witch trail, listening to an unbelievable tale about fairy stones, and then realizing that there is another man in another place with a prior claim…a husband. Every agonizing word of good-bye Jamie uttered, every stumbling step down that hill broke my heart. He did not beg her even though every fiber of his being wanted her to stay. He now knew the truth and it couldn’t be ignored. Men have integrity. He gave his word to save Claire’s life. What Jamie suffered at the hands of Black Jack Randall very nearly broke him. His sense of self was stripped to its barest essence. He knows he is damaged and believes he can no longer be the man Claire needs. Selflessly, he tries to send her away to keep her safe and whole. To the readers’ great relief, Claire will not let him go. I’m still not sure I understand exactly what she did, but she rescues his soul. Sometimes men suffer because they make sacrifices for the people they love. Men are not always strong and we love them through the weakness until they are strong again. Jamie Fraser is a man to admire and emulate. He is vulnerable yet strong. He is wise and yet naive. He is serious and yet terribly funny. He can be shy and then bold. He can be ruthless and kind. He is willing to listen and doesn’t have to be right. He is a leader and a nurturer of other men. But, most importantly, he makes Claire feel desired and loved. She bloody well can’t live without the man and neither can we. nothing to add to that, except I think it’s his willingness to be so open that I love the best. He is proud in many ways but never fails to bare his soul to Claire. Diana has spoiled us all for any other book boyfriend! Yes,I guess openness or vulnerability would have been great words to add! I thought about what you said and I agree. 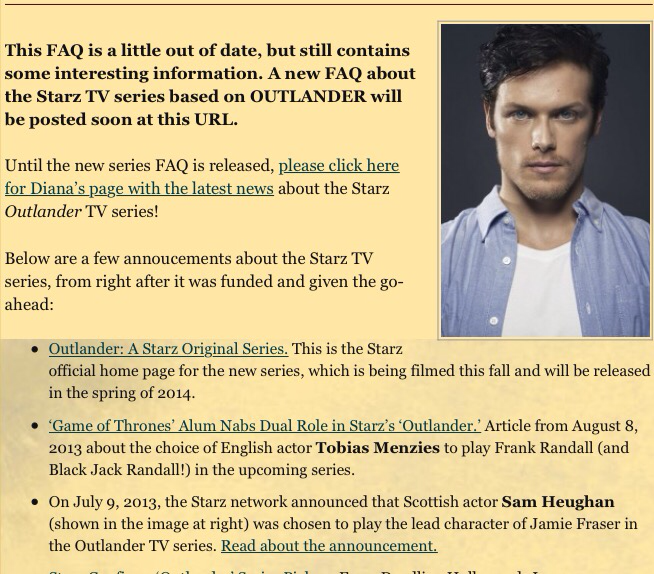 I made some changes to the post to reflect Jamie’s openness. Thank you. Very well said! You know that song “All Of Me” By John Legend? I think it is a perfect son for Jamie & Claire (if you don’t know it I recommend listening, its on youtube with lyrics) I think all their “perfect imperfections” is what make them so “real” us. For all the reasons you stated How can we NOT love Jamie? (and Claire for that matter) I really enjoyed your post. Thank you! I wanted to practice writing and tried blogging. As you can see, Jamie, Claire and Diana seemto dominate my thoughts. Glad you enjoyed it! Thank you for taking the time to write! It is very encouraging to hear others’ points of view. I’m glad you enjoyed it. I love this piece, and also the structure of it – how you laid out your “arguments” for each of the points and showed the dichotomies of how Diana gives us such a thorough, deep picture of what a “man” is, or should be. Thank you for your comments, it is nice to hear about the writing itself. I’m glad you enjoyed it! As long as there is Outlander, I’ll be writing more! Wow! speechless! This is totally accurate and extremely beautifully written. I do believe that is what and why women love these books so very much. Jamie is a man of many layers. He is the all encompassing MAN. Yet, he is also vulnerable and not without pain, and he is not afraid to allow Claire to see that side of him. I believe we search for (and if we are blessed enough) to find a man with all of the qualities that Jamie possesses. I also believe that women should learn to appreciate the man in their own lives for the man that he is. It takes a really great woman, a strong and an understanding woman to help bring a man’s true self to surface. We need to learn to support him, stand behind him and believe in him, (most importantly – show him we do all of these things) help to build him up, even when we are angry with him. We need to learn to think before we speak (do not speak in anger) and learn to respect each other for holding true to our beliefs, whether we hold those same beliefs or not. A man is so much more willing to be a “Man” when he has a true “Woman” at his side. He is also less likely to stray when he knows what a valuable gem he has in his life and as his life partner. Even Jesus states that a good woman is more precious than rubies. Sometimes it take a great woman to bring out the true qualities of a great man and vice versa. thank you so much for reading and taking the time to reply. I think it boils down to mutual respect and support in any relationship! Thank you so much for writing this post. I totally agree with all your points and VEHEMENTLY disagree with who ever wrote the article I read this morning about Jamie’s character. I don’t know who started this ‘Claire raped by Jamie’ thing and am INCENSED by the gall of such blatant lies. I was pissed to no end this morning when I read it. So glad you for your rebuttal! Never understood this point of view either. He tells her cannot be gentle this time. Strong emotions and a need to make her understand how he feels. She basically gives him permission and things rapidly change to a mutual rough romp. You left out a very important thing to Jamie himself. He is a man of strong faith. He models it, guides others with it, he offers it when it comes up, but he doesn’t preach or judge. But it is something he leans on and isn’t ashamed of. Rebecca I wrote a blog about that very topic! Jamie Fraser a man of faith! We definitely agree! “Men are not always strong and we love them through the weakness until they are strong again.” I love this line and will be thinking on it much today. Also, I agree with Connie! I love the structure of this piece! Well done. And 294th Happy Birthday, JAMMF! I believe Claire allowed Jaime to fight his post-Wentworth nightmare demons at the abbey. She set the stage to allow him to fight for himself as he couldn’t do at Wentworth, and so to begin rebuilding that “fortress” within himself that he talks about at that time. That allowed him to want to go on living and return to the world. I did later give it some thought and wrote about it of course! It’s here on the blog somewhere! Beth, the very first thing I ever read of yours was your post about Jamie Fraser, A Man of Faith and it remains one of my most favorite things ever written by anyone about Outlander. I like this post nearly as much 😉 I think my favorite passage of all the Outlander stories is Jamie’s prayer to “let me be enough” and the few chapters that follow that in Echo (gosh I tear up just thinking of that) and your recap of him here reminds me of that. Thank you for your writings, Beth! I love this! I hope you don’t mind but I’m going to post it on Twitter. At least the part about the show! Oh, please do Beth! My daughter and I have been talking about this a lot recently – I think it would be much more groundbreaking television for a show to NOT emasculate a good, strong, moral man who has faults (like our Jamie of course) but who at the end of the day loves his WIFE (and family) And as far as the Outlander show goes, I guess I really don’t mind what lines they change or leave out (well, okay there are some…) as long as they leave Jamie’s personality intact. We’ve seen precious little of it I’m afraid, though its obvious Sam is able to play it well! Not a rant loved hearing your views ! I just returned from a wonderful trip to England and Scotland. I took pocket Jamie everywhere with me. Everyone who saw Jamie and knew I was an Outlander fan greeted me like a long lost friend. It was astounding. We took an Outlander-focused tour out of Inverness and went to Clava Caerns. This is the place where Diana saw the split rock formation that became the basis for Claire’s means to travel to 174 3. We walked on the Culloden battlefield and our guide described the hopeless situation of the Highlanders. We saw old castle ruins and lochs and rivers. We understood the raw, rainy climate. From Edinburgh we traveled to the lovely town of Falkland, which was used to represent Inverness of the mid -1940’s. We had lunch at the inn used as Claire and Frank’s guest house. And we walked on the grounds if the house used as Lollybroch. It was very exciting. The Scottish people are a proud lot. They have retained their unique culture despite 300 years of English rule. Although the independence vote lost this time around, I really think it will win the next time they have a referendum. Nearly everyone we spoke to voted Yes for independence. I hope they can pull it off !! Enjoying your blog very much !!!! Wow! Thank you for sharing it sounds like you had a very good time! This is beautiful, Beth. I can’t tell you how much it has meant to me to have a strong, good man realized in print and on the screen the way Diana has done Jamie. Sorry I don’t have the words…but you do and I thank you. 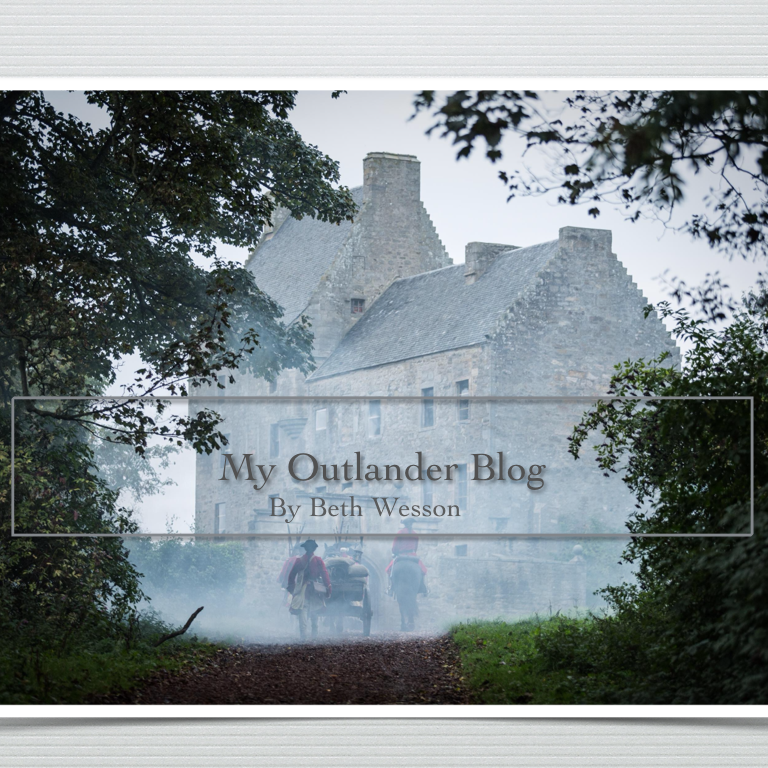 I love your blog, Beth, and am always amazed at how you take a character or situation and give me another way to look at them or it I know this is about Jamie. We all love Jamie. There is much to love. But I would also love to read your take on Frank. He’s very different from Jamie and in most ways not nearly as lovable, but he won my heart when he took Brianna as his own child and loved her as long as he lived. This after having once admitted to Claire that he didn’t think he could love an adopted child as much as their own. How difficult for him to know that Claire didn’t feel the same way bout him after she came back through the stones and there was a child to prove it? And he did, after all, leave a trail of breadcrumbs for her to follow to find her way back to Jamie. He was a long way from a perfect husband (the breadcrumbs were a bit grudging) but …. there was something there that made him want her to be happy. I don’t know what it is about this book series and these characters but I’m firmly enchanted with it all. I did write about Frank! It is on the blog under “Frank what’s a man to do?” I found out it isn’t Gellis or Dougal or BJR that are the most controversial characters, it’s FRANk! Whewwww! I see I’m very late to the party!!! I came to the books and series late but I’m trying to catch up! Frank’s history is spotty. It seems the marriage was good to begin with but the war interrupted and while Claire seemed to want to make a go of things, even though she seemed to be trying too hard, Frank was a bit more standoffish and less inclined. Wonder what happened during their time apart? I felt like he only had one foot in the door. Diana leaves much open to debate and Tobias presents Frank in such a way that I’m never quite sure what he’s really feeling. Perhaps as someone else said, his time in intelligence work made him hold things close to the vest. My husband and I gauge movies in part on how long we talk about it afterwards. I have a feeling we’ll be talking about these characters for a long time! I’m internet challenged but would love to read what DG wrote on the topic of Frank. Where would I find it? Thanks. I obviously need to go back into your archives! Hi! Yes Frank is a very interesting character! Diana’s responses can be found on the Compuserve website under writers communities.